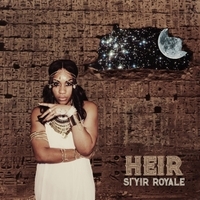 HEIR is the debut studio album by American singer/songwriter Si'Yir Royale, released November 17, 2016 on Fyu-Chur Rising Starz Ltd. The album was recorded and produced solely by FYU-CHUR and received critical acclaim from celebrities and music critics. SI'YIR ROYALE (sigh-year), is an 23 year old, award-winning Singer/Songwriter from Oklahoma City, Oklahoma. Teamed and signed with producer/executive FYU-CHUR (future), the multi-talented entertainer is rapidly on her way to the top. Her debut album "HEIR" can be describe as a gumbo of sounds, styles and genres ranging from: Soul/R&B, Pop, Electronic, Hip Hop, Experimental and more. The project is recorded, produced, mixed and mastered by FYU-CHUR at FYU-CHUR Recording Studio. In less than 2 years, the work they have created has been highly praised by celebrities and music executives such as: T-Pain, Ashley Reid of Epic Records [also daughter of L.A. Reid], Kiko (A&R of Artist Publishing Group), Che Vicious (Vice President of Kanye West’s Good Music). Si'Yir has performed at several different venues over the past year throughout Oklahoma and Texas. Her hit single ‘MAD’ placed #1 on Lawton’s local station, 97.9 (formally known as K98), for 2014 and 2015. The song gained many views on YouTube and nominated her for 6 music awards and winning her two of six at the annual 97.9 Perry Broadcasting Communications Award show held in 2015. Currently Si'Yir and FYU-CHUR are hard at work in the studio and getting ready for her next project and also are currently doing festivals and shows throughout the U.S.